In 2013, a leading east coast transport and logistics company, tendering on a grocery DC contract, was seeking a fleet of new refrigerated and dry van trailers that would optimise operational efficiencies without compromising quality. The requirements were complex: the trailers needed to have excellent thermal qualities while being lightweight and fuel economic. The specifications also demanded durability, aerodynamic underrun protection and the ability to offer flexibility with wheel and height packages, while utilising locally available and supported componentry. Wabash, a US-based company with a reputation for innovation and performance in the engineering of both refrigerated and dry trailers, stood out. 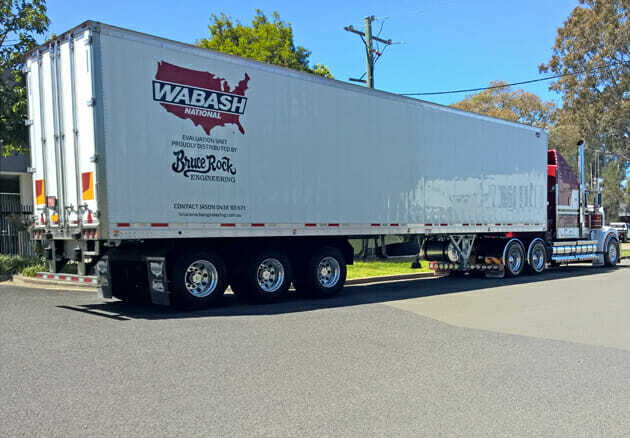 Thermally efficient, lightweight and extremely robust, the Wabash trailers had been proven to reduce operating costs and keep clients on the road longer. In 2014, following the award of the five year grocery contract to the east coast carrier, a total of 11 Wabash fridge vans and 10 dry vans were purchased. The Wabash fleet was placed into service alongside the company’s existing trailers to evaluate the operational and cost efficiencies. All trailers were built to 3.9m height for low supermarket loading docks, could load 26 pallets under PBS and had aerodynamic underrun protection. The Wabash trailers were not only more than one tonne lighter than their Australian counterparts, but proved to be up to 30% more efficient in fridge motor fuel consumption saving an estimated $3,000 in fuel costs per year. The lower TARE weight also contributed an estimated 2% to 3% savings in prime mover fuel consumption. Today, the Wabash trailers continue to prove their durability – travelling more than 200,000km per year with significantly lower operating costs to date than their Australian-built competition.